Cycling tours have been enjoying something of a revival in recent years – and with the increasing awareness of the cost to the environment of traditional holiday travel, their popularity is building amongst a growing number of people who are rediscovering the fun to be had with bikes. Whether you’re looking for a little gentle cycling, or something more vigorous and challenging, from touring the British countryside to somewhere much further a-field there’s sure to be something to suit – whatever your level of experience or budget. If you opt to sort out your own arrangements – perhaps with a few friends – then obviously it’s up to you where you go and what you choose to visit along the way. This obviously provides the greatest flexibility and it’s certainly hard to beat as the ultimate in literally free-wheeling holiday adventures. However, while this idea has a lot going for it within Britain and familiar European destinations, most people who are planning on venturing a bit more off the beaten track tend to opt for one of the many organised trips. Although you may find your choices of itinerary a little more limited, there are advantages – not least in terms of having all your accommodation taken care of and a representative on the ground in the event that you need any help. In general there are two types of organised cycling holiday on offer – the guided group tour and the self-guided trip. Guided group tours provide the opportunity to make new friends and enjoy the social side of cycling alongside the travel itself, with a local guide on hand to make sure you get to appreciate the cultural, historical and natural riches of the environment you’re cycling through. 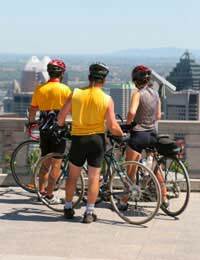 Self-guided tours are really intended for the individual traveller, couples or smaller groups of friends; all the reservations are made en route, but the self-guided cyclist is expected to be a little more self-reliant in terms of any necessary repairs or minor mishaps along the way. Cycling tours typically cover between 20 and 40 miles a day – which means the pace is about right for most reasonably fit cyclists, so you certainly don’t need to be in training for the 2012 Olympics to take part! The tour companies usually give very good indications as to the terrain, difficulty and likely levels of experience required, so a thorough read of the descriptions – and a careful look at the daily mileage – should make it fairly straightforward to pick the right one for you. Of course it’s always wise to give the whole question of physical exertion some careful thought, especially if you are not in the habit of doing much cycling and if you have a medical condition to consider, then a chat to your GP is obviously a must. Even if you don’t feel up to 20-plus miles a day in the saddle, there are plenty of “easy” or “leisure” tours to choose from, so there’s no need to give up on the idea of that cycling holiday entirely. On the other hand, there’s also a good selection of “advanced” and “experienced” tours too – so even the most hardened cycling enthusiast should be able to find something to suit. It’s not so much where can as where can’t you go? Beyond the familiar hills and hedgerows of the UK, there are cycling holidays available on every continent except Antarctica. From bike and barge tours of Germany and the Netherlands to trips across the USA and Canada, or journeys in Tibet, Thailand and even Tonga, if you can find it on the map, there’s probably someone offering you a chance to cycle through it. Whichever way you look at it, there’s probably never been a better time to get on your bike!